As posted by the Canmore International Developmnet Awareness Group, March 16, 2012. 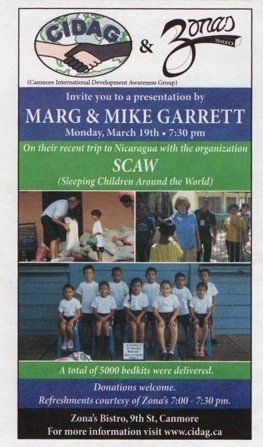 Mike and Marg Garrett (Canmorites) will be talking about Sleeping Children around the World. They were in Nicaragua in Oct 2011 delivering 5000 bed kits with a team led by Judy Dryden, daughter of founder Mike Dryden. This was Mike’s first trip with them, and Marg has done several trips. We were pleased with the interest and participation shown last season and are excited to be able to continue and hopefully grow this next year. Again we have to thank Chris Dmytriw for being able to use Zona’s for the Monday evening presentations. For more information, click on the link to the CIDAG website.